We say goodby to all the folks at Philbrooks (now for the forth time) and are away from the docks at 2 pm Friday afternoon. Nick our electrician has just finished installing the new fuel solenoid into Puff the Magic Dragon now version 3.0 ( our diesel heater) which arrived at noon. We will start our journey north to Desolation Sound hoping that this was the solution to our heater problems. If the heater fails today or tomorrow we will head back at Philbrooks next week. We are optimistic that this was the magic solution to make our dragon roar reliably. With the beautiful Friday afternoon weather, many boats are on the water. We have decided to head north through what we call the back door route via Sansum Narrows. 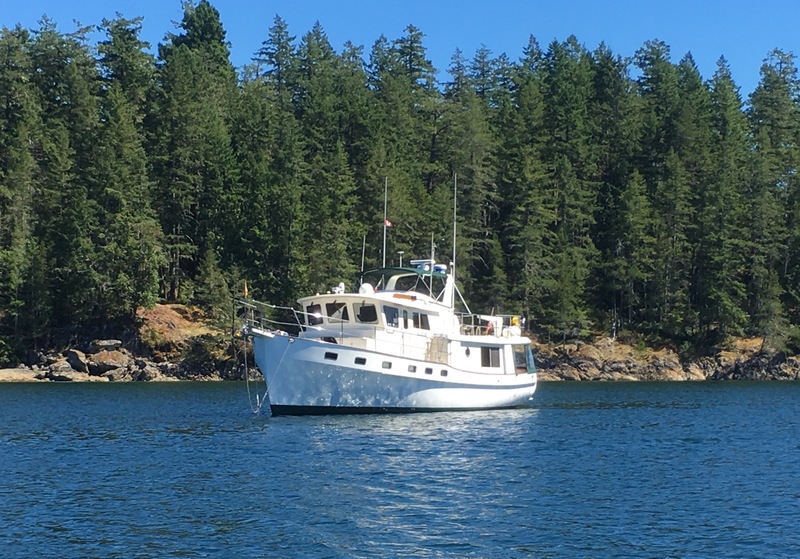 Satellite Channel around the west side of Salt Spring Island leads us to the Narrows. 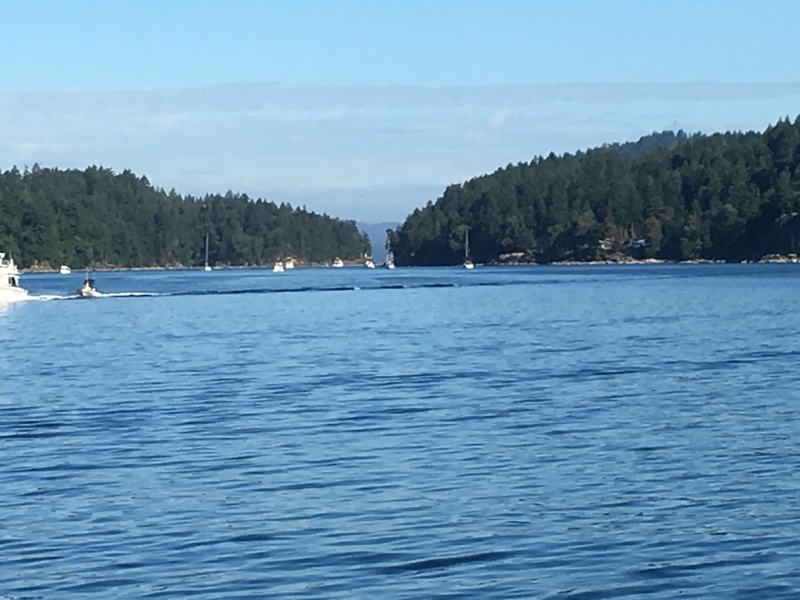 The high bluffs of Salt Spring on our starboard with Vancouver Island on our port make this narrow passage beautiful and dramatic. These are relatively benign narrows compared to others that await us farther north. Our trip is uneventful and we arrive to North Cove on Thetis Island at 5:00PM. 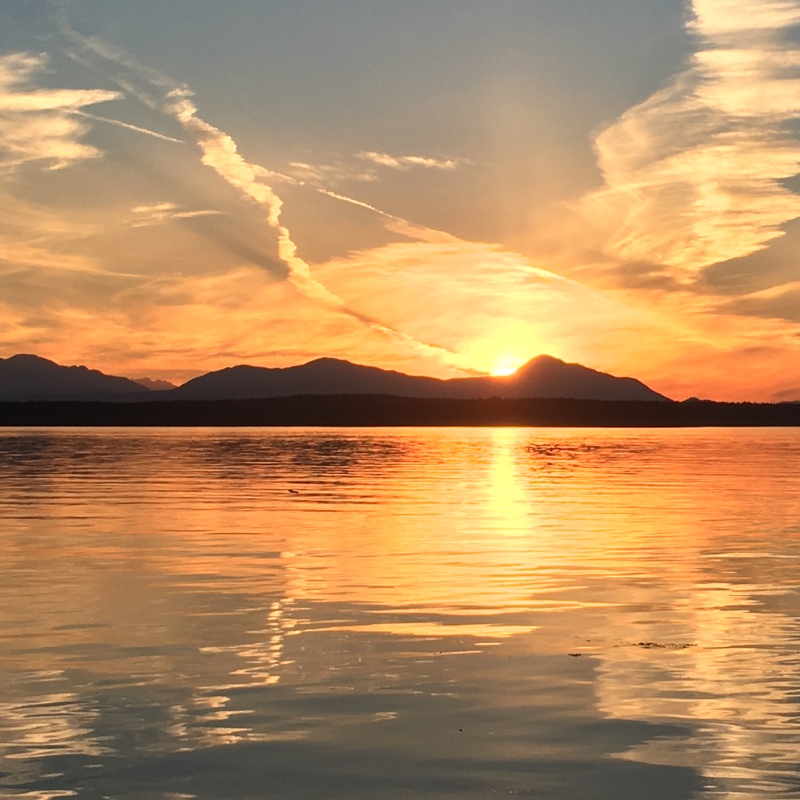 This is another beautiful anchorage in the Gulf Islands with a great sunset. Puff continue to fire away. Tomorrow we will transit the dreaded Dodd Narrows! It is another beautiful day for a boat ride. We haul anchor at 7:30 AM eager to get underway and through Dodd Narrows at slack tide. 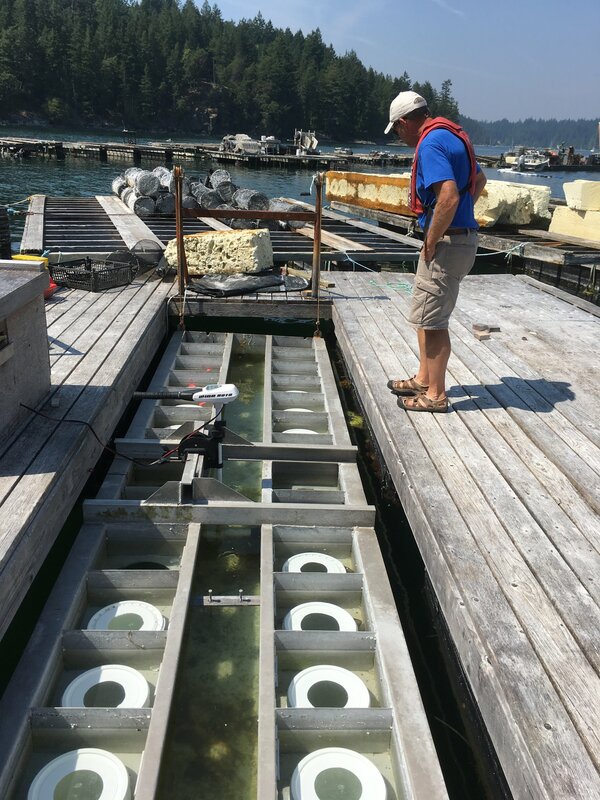 We check and double check our calculations for slack tide at Dodd Narrows. 9:41 AM is slack but we will be there earlier. The predicted times are usually pretty close but slack can vary up to 30 minutes and you don’t want to be late. Currents through this passage run up to 9 knots. Our guide book recommends transiting these Narrows only at slack. As we approach the Narrows we can see maybe 10 other boats ahead of us, also waiting on slack current. We fall in line behind them like little ducklings following the mother duck. We arrive thirty minutes before slack but there seems to be little current. The first few boats make a “Securite” call on the VHF announcing their intentions. This is a narrow dog leg passage with no visibility to the other side. Protocol is for all boats with the current to go first. At slack and after the current turns, the other side then transits. There is not room for two boats to pass in the Narrows. 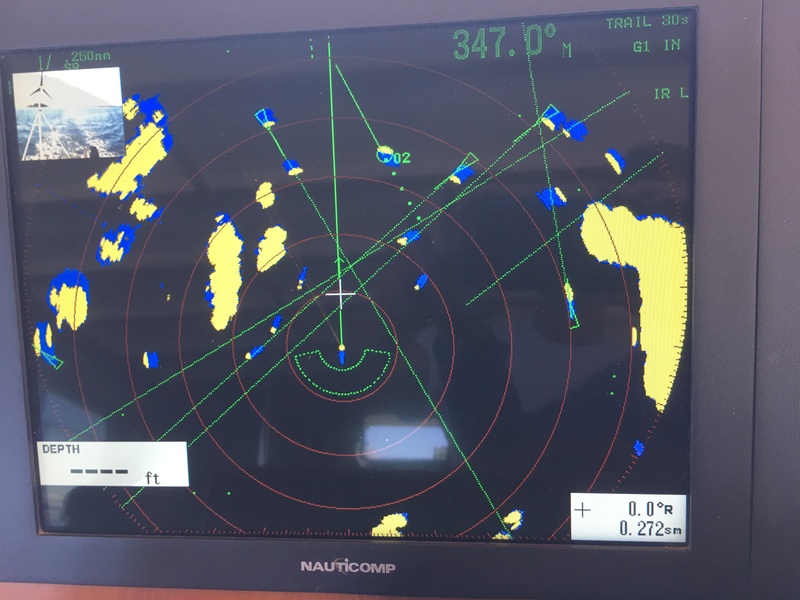 Just after we make our “Securite” call and enter the Narrows, we see three sailboats entering from the north completely unannounced. Why do these things always happen to us! The first two sailboats manage to squeak through just before us. We meet the third sailboat in exactly the wrong spot. He seems completely oblivious to what he just did. Reaching the other side, a 40 ft. trawler is patiently waiting for us to transit. We thank him for his courtesy. Other than the issue with the sailboats, Dodd Narrows was a relatively easy pass. Going through here at any time other than slack could be a different story. There is even a bench at the narrowest section where islanders come to watch this spectacle. We will have quite a few more rapids to transit as we work our way north. This was a good learning experience for us. Just after exiting Dodd Narrows there was a dramatic temperature drop of maybe 10 degrees. The good news is Puff (our diesel heater) is still working well and keeps us nice and toasty in the pilot house. 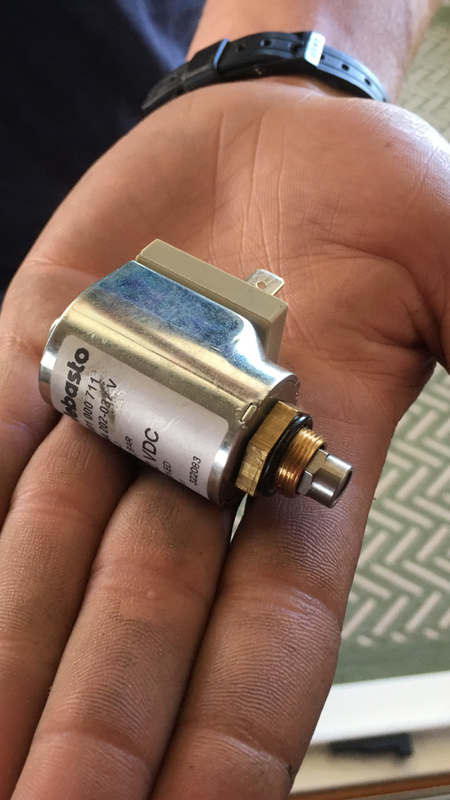 Looks like maybe the new fuel solenoid solved our heater issue. Thank you Philbrooks, Ian, Nick, and Ryan for all of your help with the heater! Just past the Narrows, we reach the busy port of Nanaimo. Several empty tankers are at anchor along with three BC Ferries entering the harbor. It is a busy Saturday Morning. The weather forecast looks good so we decide to cross the Strait of Georgia today for mainland British Columbia, nicknamed as the Sunshine Coast. You need good weather to cross the Strait of Georgia as it is a big body of water, 110 miles long and 20 miles wide. The winds can funnel up or down through the Strait and if opposing the currents, waves stack up and can become quite treacherous. The forecast for today calls for 5-15 kt. SE winds with seas less than one foot. We also must listen on the VHF weather forecast to see if “Whiskey Golf” is active today. This is a deep water military range in the Strait of Georgia that is operated by the Canadian and U.S. Navies. This area is used to test torpedoes and other military equipment. When active, boaters must travel a safe transit route around the area. It is not active today so we are free to cross directly to the other side. We quickly discover that weather forecasters are no better on the west coast than the east coast. Half way across the Strait we find ourselves in 3-4 ft. seas with winds over 20 knots. At least they got the direction right. As usual, IT handles the seas much better than we do. Did I mention the waves are on a 3 second period! Life is much better when we reach the mainland. 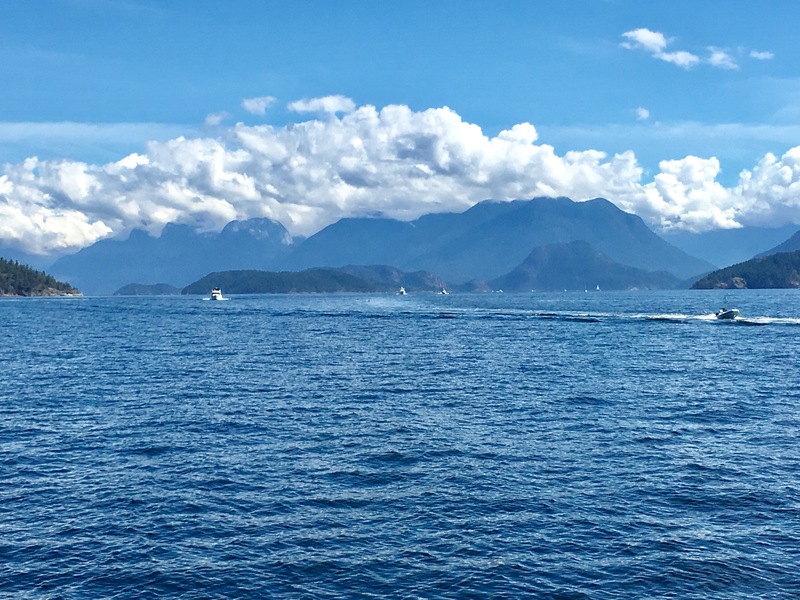 The towering beautiful granite peaks to the east block any wind and we have an enjoyable cruise into Pender Harbor. This area reminds us of Maine with the evergreens carpeting the mountains down to the rocky shoreline. Care must be taken to avoid the many shoals lurking below the surface. Pender Harbor is really a collection of several harbors, two of which have marinas with fuel and supplies. It is a busy area with cottages occupying every square foot of land and small boats coming and going through the harbors. The primary anchorage of Garden Bay is completely full of boats both tied to floats and swinging on the hook. It is a little too crowded for our liking so we decide to anchor in Gerrans Bay just across the harbor from Garden Bay. This small Bay is also lined with cottages and has a few boats at anchor. The towering hills surround us with good wind protection. Once the dinghy is down, we explore the environs of Pender Harbor. There is not much here, only two small restaurants and some older marinas. As we are leaving the dinghy dock, a young lady with a backpack full of groceries hails us. She ask if we are heading to the anchorage in Garden Bay. We had already come from there but are happy to give her a ride anyway. Her husband is aboard with their three young kids and it would have been an effort to load the kids in their dinghy to come get her. Turns out Nicole is from Vancouver. She gives us several good tips for visiting there. We also learned a new Canadian word from her. Do you know what Skookum means? Puff continues to be skookum all through the night. It is an early start this morning (5:30am). Winds are forecast to pick up this afternoon and blow all day tomorrow. 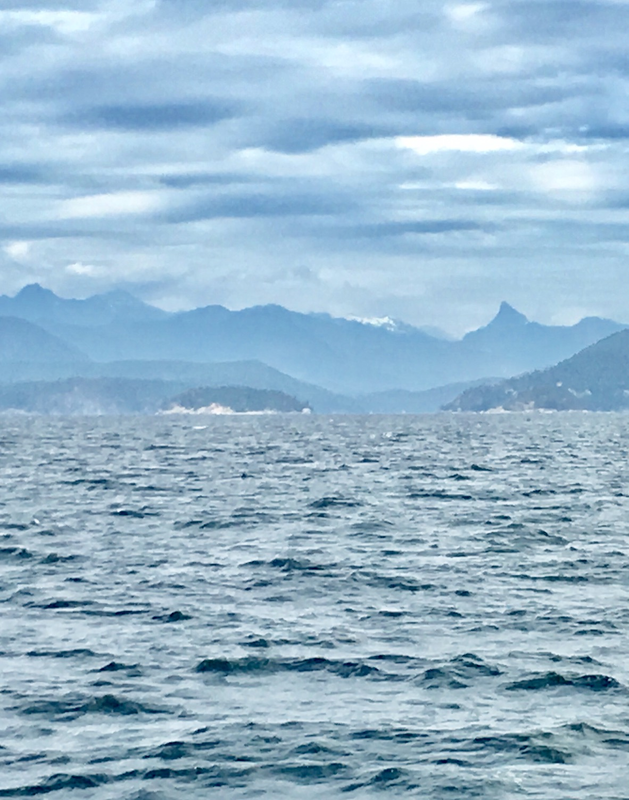 We have 50 miles to travel before we are in the protected waters of Desolation Sound and would like to get the open water passages behind us before the wind arrives. Leaving Pender we travel north through the Malaspina Strait on the east side of Texada Island. This Strait is very deep with depths over 1000 feet yet it is just two miles wide. We are rewarded with great views of the British Columbia mountains to our east. Once past the northern tip of Texada Island the seas become lumpy as we are now exposed to the northern section of the Strait of Georgia. 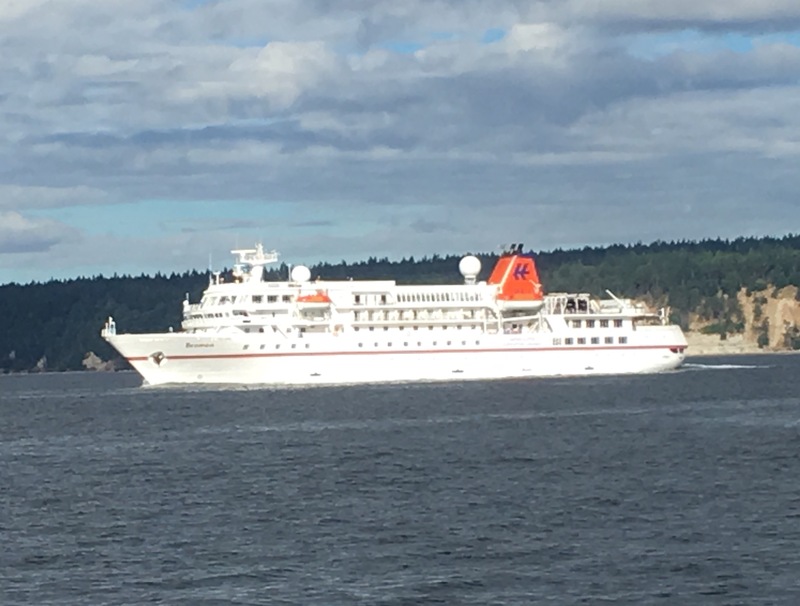 Cruise Ships travel the Strait on their way to Alaska. We see one heading south today. 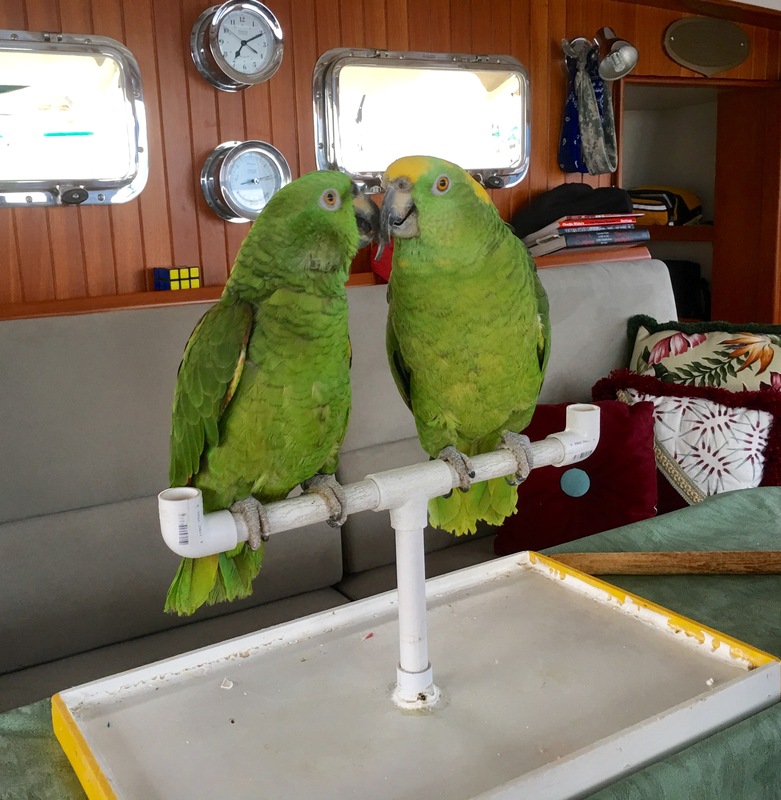 Nate and Primo enjoy spending some time with us in the pilot house today. Even though Primo was with us last year, he seems a little unsure of his surroundings. 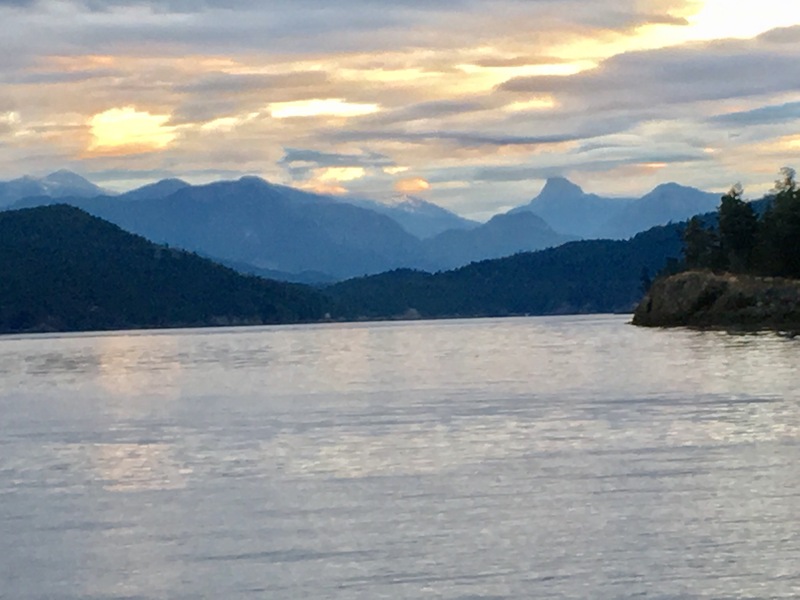 Cortez Island marks our official entry into Desolation Sound. 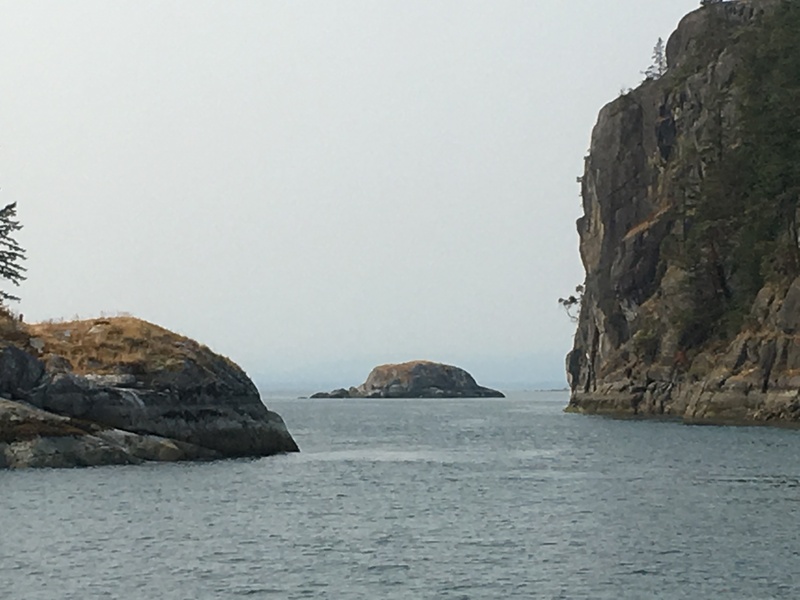 This area was named by Captain George Vancouver in 1792 as he surveyed this labyrinth of fjords and inlets. This wilderness area seemed to him desolate and inhospitable. Today it is British Columbia’s largest marine park with over 40 miles of shoreline. It is ironic that the area is now one of the busiest cruising areas of B.C. during the summer months. Yes, there are boats everywhere today. These blue dots on the radar are other boats. The scenery couldn’t get much better than what we have right now. The photos just don’t capture the grandness of the towering jagged mountains peaks. Our anchorage for the next few days is in Squirrel Harbor. The narrow cut entrance leads us to a large bay surrounded on all sides by wooded forests and high mountains in the background. The anchorage is busy with over 50 boats. Even so, there is plenty of room for many more. 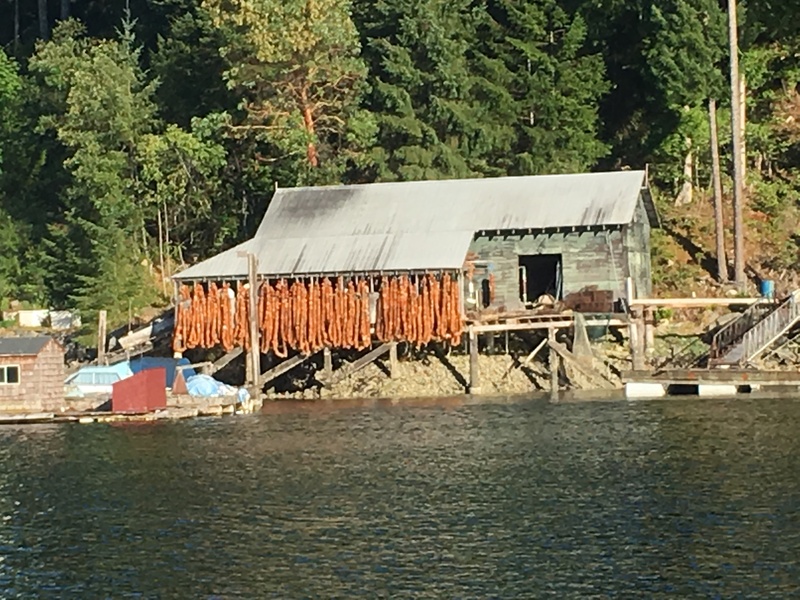 Just outside the anchorage is a General Store and The Flying Squirrel Takeout. 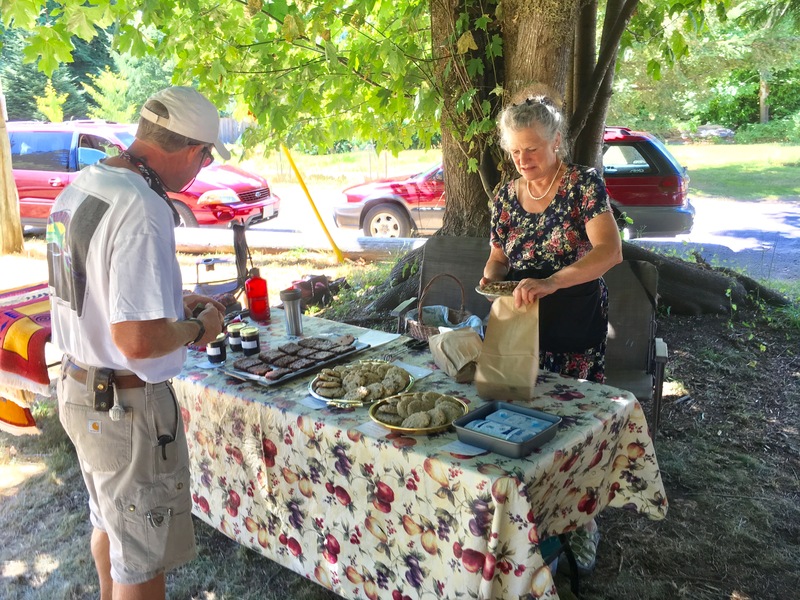 Today is also their Farmers Market. It is a small market with only three booths. We head directly to the booth selling pies and fresh bread. There is one pie left, a raspberry cream cheese which we grab along with a fresh loaf of wheat bread. Two days are spent here enjoying the scenic anchorage. We dinghy around the harbor several times in search for a trail mentioned in the guide book that connects to one of the other anchorages. 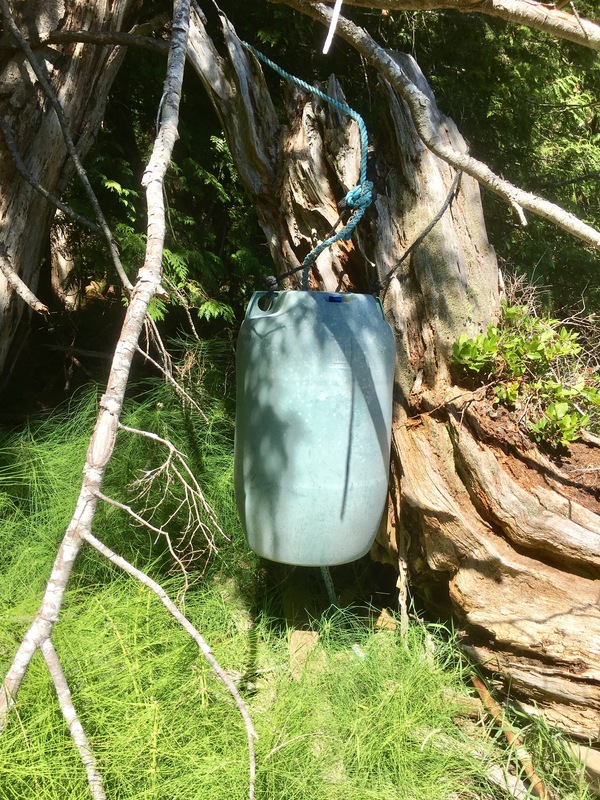 After much looking, we spy a light blue barrel tied to a tree. Upon further investigation, we find the trail here. It is a nice mile hike to Van Donop Inlet through the dense wooded forests. Van Donop looks like a nice anchorage with quite a few boats swinging on the hook. At some point we will anchor here with Idyll Time. Tomorrow we will explore more of Desolation Sound. After two nights in Squirrel Cove we move over to the west side of Cortez Island to an anchorage know as The Gorge. It gets its name from the entrance which is a steep narrow rock cut. This large bay houses a marina with a small grocery store. The anchorage off the marina is very busy so we continue to the harbors’ east end where we find much more solitude. 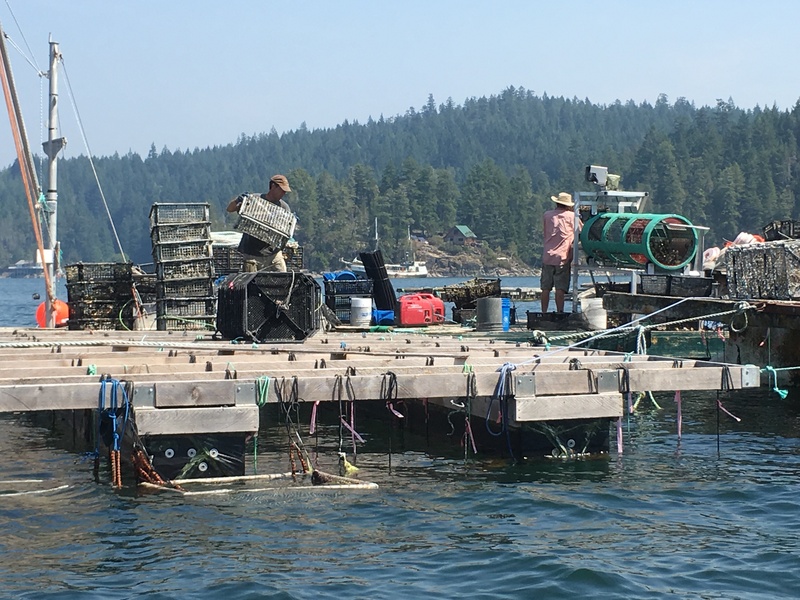 This bay is home to several oyster, clam, and mussel farms. A friend of ours has arranged for a tour of the oyster farm for us. Zach, our guide, picks us up at the public landing and takes us out to one of the oyster platforms. We were able to see the life stages of the oyster from the tiny juveniles to mature shellfish ready for sale. This process takes several years from start to finish. Tomorrow we hope to continue north towards the Broughtons. We will have several Rapids to transit over the next few days. More on the Rapids in the next post. Thanks for following along. This entry was posted on August 5, 2017 at 2:55 am. You can follow any responses to this entry through the RSS 2.0 feed. You can leave a response, or trackback from your own site.